What do microscopic molecules and huge computer grids have in common? They both build up giant scientific databases of ecosystems around the World. But it is a tricky process. This is the story of how researchers around the Black Sea are struggling to get the bigger picture out of tiny details. On the shores of the Danube River there is an unusual team. Romanian and Ukranian scientists are embarking on a common research trip. They are assessing the hydrological and biological health of the Danube Delta, a huge Biosphere Reserve shared by both countries. The news is good. “Algae blooming is decreasing. And lately we have seen the development of some aquatic species that are biological indicators of a better quality of the water around here,” explains Jenica Hanganu, Ecologist of the Danube Delta Research Institute. Less industrial discharges and more efficient water treatment plants are indeed improving water quality in the Danube Delta. But the region is facing other challenges. Challenges are similar on the Delta’s Ukranian side. The river’s own environmental patterns are no respecter of the political borders. “The main problem on the Ukranian side of the Delta is dramatic high water levels caused by floods. Also, the construction of dams along the Danube has caused difficulties in the water exchanges between the river and the adjacent lakes – that leads to the ecological exhaustion of these basins,” points out Mikhail Kornilov, Hydrologist with the Danube Hydrometeorological Observatory. Water samples, zooplancton and sediments gathered during the research cruise are then taken to labs for further analysis. Here again the news is encouraging as Liliana Teodorof, chemist with the Danube Delta Research Institute explains: “Over the last few years, we have indeed seen a decrease in the concentrations of heavy metals like cadmium, zinc and lead. These heavy metals, originating from industry and agricultural sources, are still present, but their incidence is retreating both in the sediments and in the water of the Danube Delta”. This chemical, atmospheric, microbiological and zoological data gathering is regularly performed on the Danube Delta. But the results are not kept in a lab’s drawer. Instead, all this data is flying high. In Geneva, environmental data from around the Black Sea basin, including the Danube Delta, is being used to elaborate interactive maps and databases for the sake of busy researchers. “They say that we researchers lose 50 percent of our time, if not more, sifting through all the scientific data. And often it arrives here in very different formats, with qualities which are also very different. So we have to transform the data to be compatible with the software we use,” explains Gregory Giuliani, Environmental scientist, with the University of Geneva. 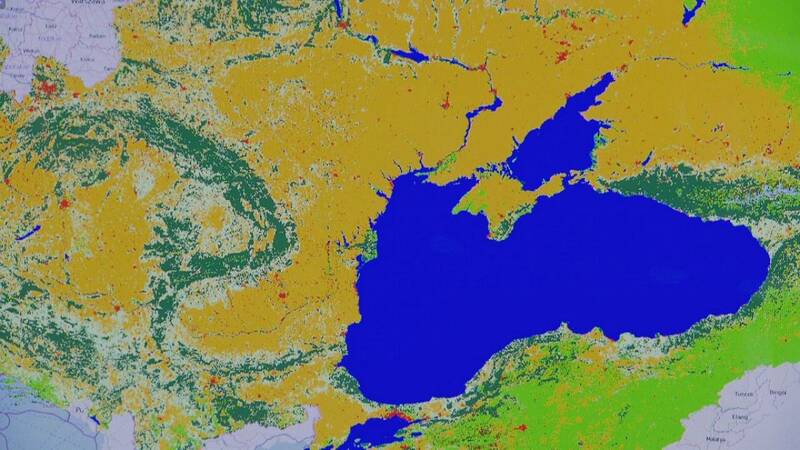 The whole Black Sea basin is 2.2 million square kilometres, which means a deluge of daily data to be processed. Researchers have so far developed computer models for soil uses, demography and hydrological data – like water flows or level of pesticides – in the Black Sea basin, shared by 20 countries. And all is provided in formats adapted to different platforms. “Here we see the same example, it is stored in our system and, in one click, I can see it on Google Earth. Potentially I can also take it on a smartphone or tablet, I can see exactly the same data, and we’re going to immediately start working, and thus spend more time doing the analysis of what we have been given or understand the phenomena instead of wasting time looking for information,” says Gregory Giuliani an environmental scientist at the University of Geneva. Experts in computer modelling have teamed up with environmental engineers to come up with a precise picture of diverse environmental data in big rivers like the Danube or the Dnieper, but also in hundreds of small streams flowing to the Black Sea. The challenges were huge as Elham Rouhollahnejad an environmental engineer at the Eawag Institute explains: “We used topographic maps to make our hydrological models. And sometimes those maps lacked resolution. In this case, for instance, this particular river is disconnected. It is the same water flow, but it looks like two different rivers. So we had to carefully, manually, correct it. Otherwise, our calculations on flow rates or water inputs would not be accurate”. The effort is based on what is called “Global Earth Observation”, designed to use monitoring technologies to build up scientific databases. These databases are set to offer up-to-date, interactive, open data of whole ecosystems and geographical regions around the World. “Today the technology we have for observing the environment is very sophisticated, with satellites, sensors, with the Internet to disseminate this information. So we are light years from what was done in the past. But we have lost connection with the real environment. So for me the main issue of this whole effort of information sharing is to reconnect our society with this complex environment,” says Anthony Lehmann, Coordinator, EnviroGRIDS project. And back to the Danube Delta, researchers are indeed already looking for practical applications to this easy-to-use access to key environmental data says Mikhail Kornilov, Hydrologist with the Danube Hydrometeorological Observatory: “The integration of all data from various countries will allow us scientists to have the whole picture about the situation in the Black Sea basin. That should help us, for instance, to assess and forecast different scenarios of eventual climatic changes in the area”. Jenica Hanganu ecologist with the Danube Delta Research Institute adds: “We can later on use this data to improve our strategies for taking measures against flood risks, biodiversity losses or changes in the ecosystems”. And as the sun sets in the Danube Delta, researchers say, a new dawn in environmental data gathering is in the making.